Today’s workspaces have changed. Smaller groups, impromptu get-togethers, multiple devices and remote workers are the new norm. So how does this impact the connected AV technology offices need? HARMAN Professional Solutions Asia Pacific vice president and general manager Ramesh Jayaraman explains. How we work has changed and the effectiveness of modern offices is only as good as the technology that’s there. Creating an optimal working environment means making use of technology to facilitate collaboration in today’s remote, mobile and travelling workforce. There’s a lot of psychology behind effective communication in the work environment. When issues begin to happen with audio and video not only is it frustrating, it can actually alter the outcome dramatically. So it’s important to take technology seriously and choose products that work in harmony to support the human side of creativity. Audio, video, conferencing, sharing and scheduling are critical to support the team while acquisition, installation and management are important to those designing and maintaining the technology. So with this in mind, is it time we re-thought the technology we have in our meeting spaces? Are we using the most effective technology? One of the big questions for today’s organisations is around Bring Your Own Device (BYOD). The separation between work and personal devices has reached the stage where many people prefer to work on their own devices. Often they work more quickly and efficiently on these devices¬–and they’re happier too. So it’s easy to see why companies want to consider this, even if there are concerns within the wider business. From an AV perspective it’s a tricky subject and one that can cause issues if the room isn’t fully equipped to accommodate the device. Whether you are dealing with ‘true’ BYOD (where employees are using their personal devices in the business environment) or simply a situation where employees bring their company laptop into the conference room, the system needs to be ready to handle it. But no matter how well-equipped a BYOD-ready room is, if the employee doesn’t have a device to bring they can’t do anything with the conferencing technology unless the room also provides a means of delivering presentations, sharing schedules, etc. Most of these can be done using a PC, which is why laptops are popular. With a laptop you can give a presentation, share a document, use the internet and share images. Collaborating from multiple devices is a bit harder but with the right software even that is technically possible. However, there are still a number of situations where employees can’t use their laptops or mobile devices in a meeting. For a start, some employees may not use a laptop or have a tablet. Even when employees do have a device, they can sometimes be reluctant to use them. Having pop-ups for personal emails and other notifications on the big screen can be annoying or embarrassing. The traditional answer to this has been the room PC, which ostensibly solves the issue for employees that can’t BYOD. IT departments ensure these machines have the software they need and in theory they can handle all necessary activities. However, in practice this is often much harder because IT departments typically just install a standard IT image on the machine, do some basic configuration and leave it at that. The underlying issue is that the PC operating system has a user interface designed for a single user who sits in front of the display and works at the same machine every day. In a conference room, a different employee uses the machine every hour or so. Every time a meeting starts the new user logs into the room PC with their corporate credentials. This creates a new user profile on that PC, which takes time to create and eats up space on the machine. After that, the user profile loads, which can take several minutes, wasting time and company money. When the meeting ends, the user logs out and shuts down the AV system. At least, that’s what happens on a good day. Other times, the employee walks out without logging off or shutting down, leaving easy access to the user’s email and more. This presents a risk both to people outside the company who may be in the building and to employees who may not have authorisation to access certain information. Even on a good day, if the previous user downloaded anything but didn’t delete it before they left, that information could be accessed by someone else, even if they log in using a different profile. Imagine a meeting discussing employee salaries or an upcoming acquisition. This information shouldn’t fall into the hands of employees that don’t have permission to access it but in a conference room setup like this, that is all too possible. Such an incident could not only cause potential disruption in the workplace but also have real legal implications. Thankfully, there is an alternative to the room PC. The AMX Acendo Core has been designed specifically for meeting rooms. First and foremost, this means the interface is readable and easy to use on a large-format display in a meeting space. Icons are large and readable and the layout is focused on making it quick and easy to perform all the actions you need. In addition, starting the meeting is dramatically simplified. Users walk into the room and see any scheduled meetings on the display outside so they know they are in the right room. The user opens a new session to easily start the meeting and the interface loads quickly, without the need to login or create custom profiles. If a videoconference is scheduled, that can also start at the press of a button. Users can even wirelessly connect devices, with up to four devices able to be displayed on the screen at once. When the meeting ends, the user simply ends the session, which deletes any downloaded files, providing privacy and security. With the AMX Acendo Core, conducting a meeting without bringing a device into the room is dramatically simplified. Meetings start on time, end on time and run smoothly in between. As well as considering the technology we use for meetings, it’s also worth reconsidering how we conduct most meetings in today’s modern office environments. For one thing, there’s less space in most offices, as rising real estate costs and a trend to open-plan working make for a different working configuration. At the same time, we are seeing a decline in the number of larger conference rooms and a rise in the number of small collaboration spaces. Small meeting spaces – or huddle spaces – are purpose-designed for small groups and quick collaboration. For us at Harman Professional Solutions, key components of an effective technology package for huddle spaces include: one-click meeting launches using your preferred software platform; intuitive document sharing; pristine audio and crisp video. Our belief is that technology should not only work as it’s expected to but also support productivity and inspire creativity. 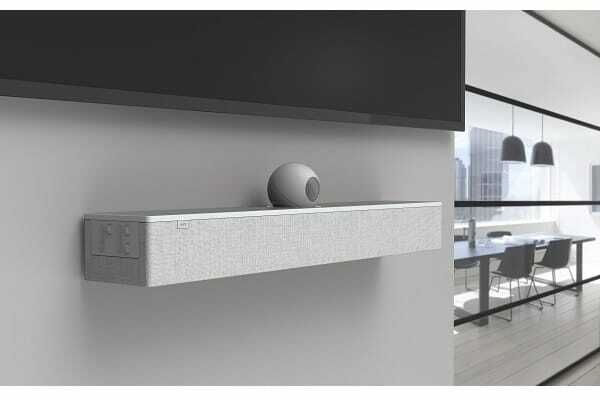 Acendo Vibe Conferencing Soundbars are purpose-built for huddle spaces, with just the right mix of videoconferencing features and aesthetic design to empower highly productive collaborations. However, it’s worth noting that while the Acendo Vibe products may have been designed for huddle spaces, they are equally effective in large spaces. This makes them especially relevant for companies who may be wondering how to bring high quality, simple-to-use conferencing equipment into a larger room space—without adding a lot of extra complexity. In these larger spaces, the challenge is that the rooms need acoustic echo cancellation (AEC) for calls but require four or more microphones throughout. They also require more complex video switching, and because ceiling speakers are standard in these spaces, an amplifier is needed. It is these needs that have traditionally led to complex AV systems with racks full of gear. Thankfully, with a combination of the AMX Incite All-in-One Presentation Switcher, BSS DCP-555 Digital Conferencing Processor and the AMX Acendo Core Collaboration Platform, easy to use collaboration is possible with less space in your rack and less complexity in your system. To deliver optimum productivity they are also designed to work alongside the popular AMX Acendo Core mentioned above. As stated, AMX Acendo Core allows users to easily connect to any web conferencing platform without needing a separate device. Video switching and distribution is provided by the AMX Incite and audio is routed through the BSS DCP-555 for microphone mixing and AEC. The audio is then routed back through the AMX Incite, leveraging the built-in Crown DriveCore amplifier before heading to the JBL speakers. Control is provided by the Incite’s onboard NetLinx NX controller. With this solution, collaboration in larger spaces is simple for users—and simple for integrators as well. Today’s workplaces can be characterised by the quick collaboration that’s required from teams. To make that practical, offices need to offer effective meeting spaces and, of course, videoconferencing. In fact, the need for this type of meeting space is only set to increase as more millennials enter the workforce. Videoconferencing is not only on the rise, it’s the new normal. Meetings have to happen without workflow interruption, with technology that works. Grabbing a laptop or mobile phone and finding a quiet corner is not optimal for group collaboration. For today’s work environment, technology really is the final piece of the puzzle. Put together the right talent, in the right spaces, with optimal technology and amazing things will happen.